My daughter squealed with excitement. Here I was dreaming of making snowman ornaments while she dreamed of bringing Olaf to life. 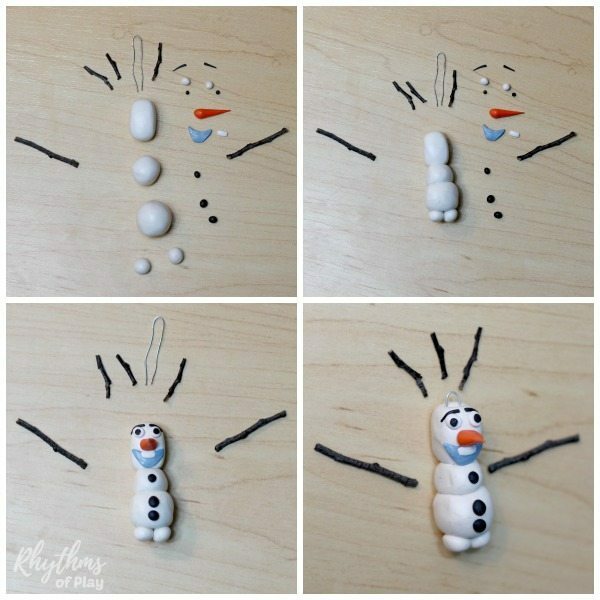 She helped me make these cute little snowmen ornaments, then I helped her figure out how to make some Frozen inspired Olaf ornaments. We even made snowman head ornaments! 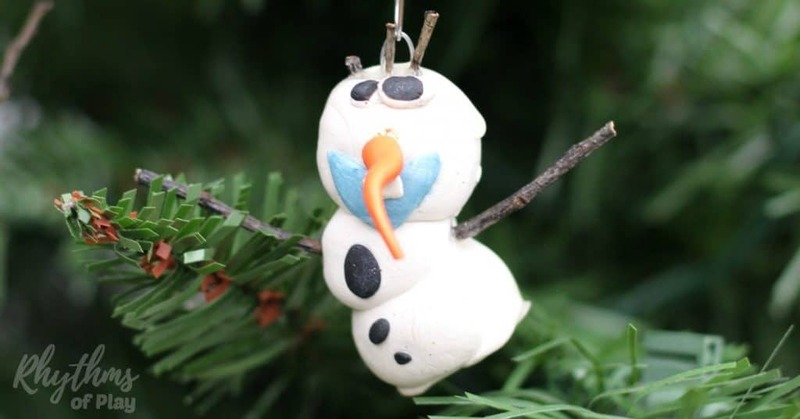 Have fun connecting with the kids making snowman ornaments this holiday season. 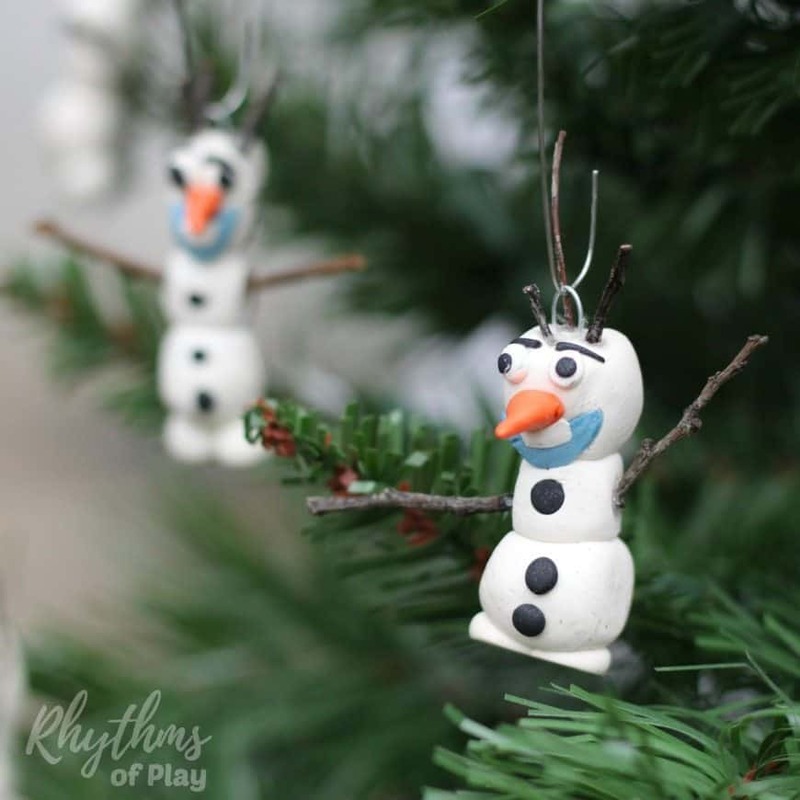 Whether you want to make a classic snowman, snowman heads, or a Frozen-Inspired Olaf ornament the supplies are the same. Might as well try them all! Click on the links to find the tutorial for the other snowman projects. Wash your hands and clean the surface you will be working on. Polymer clay picks up every speck of dirt it can find. When working with white this is especially important. Basic directions and a photo tutorial can be found below. 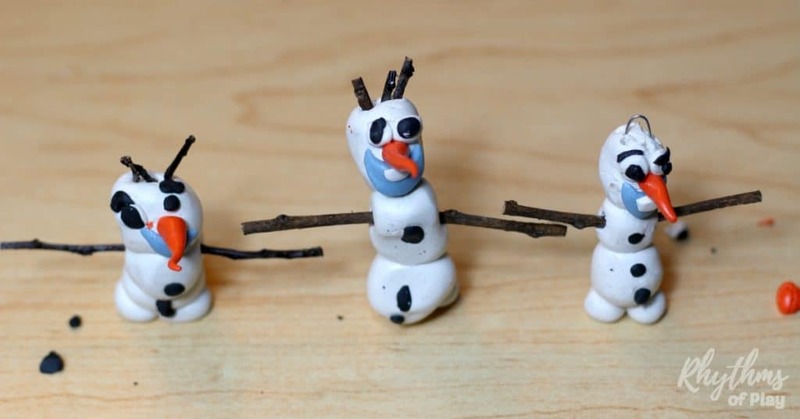 Make clay pieces of Olaf; body, snowball legs, nose, eyes, eyebrows, mouth, tooth, and buttons. The easiest way to make a carrot nose is to roll a little bit of orange polymer clay into a small ball. Next, roll one side of it like a snake until you have a small carrot. Select and trim twigs to use for arms and hair. Cut 2-1/1/2 inch section of galvanized wire. Bend it in half. Place this hook prongs down into the top of your ornament so you can hang it when you are finished assembling Olaf. 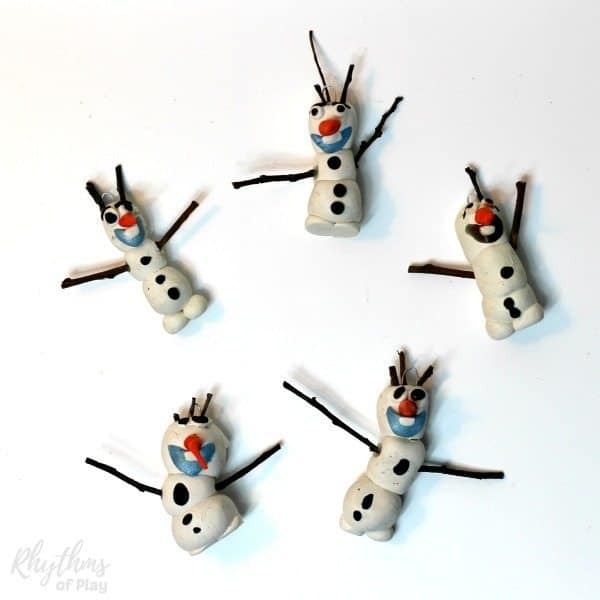 Assemble Olaf by sticking the clay pieces of his body together. Start with the body next attach the mouth, tooth, nose, eyes, and buttons. Last add twig arms and snowball legs. Have fun making him in different positions if you wish. (Optional) Pull out each twig arm and each piece of twig hair one at a time. Place a drop of polyform bake and bond (also included in oven bake clay bond and glaze pack listed above) into the hole and insert the twig back into the hole. 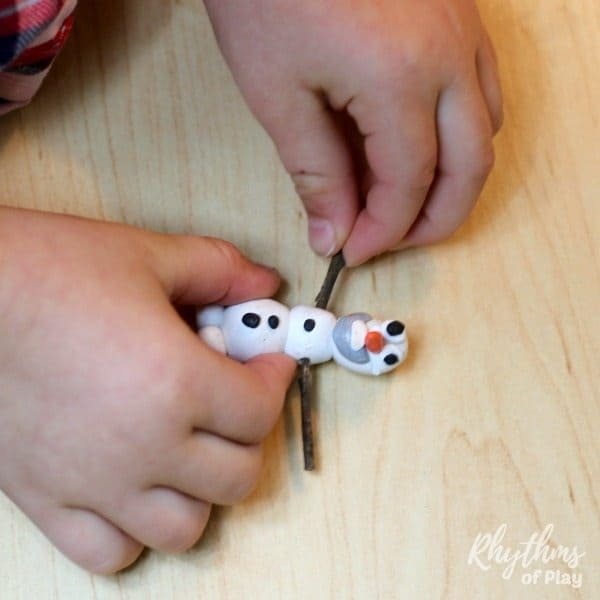 We found that this really helped the twigs attach to Olaf’s body the best. Bake according to polymer clay manufacturers directions. We baked ours in a 275 F oven for 25 mins laying down on a baking sheet lined with parchment paper. Look at all of the wonderful Olaf ornaments my daughter made! Aren’t they awesome! 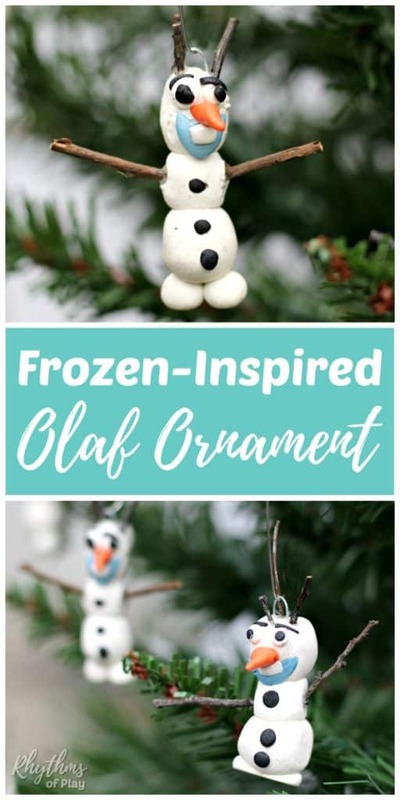 She made a total of five Frozen Inspired Olaf ornaments and she still wants to make more! 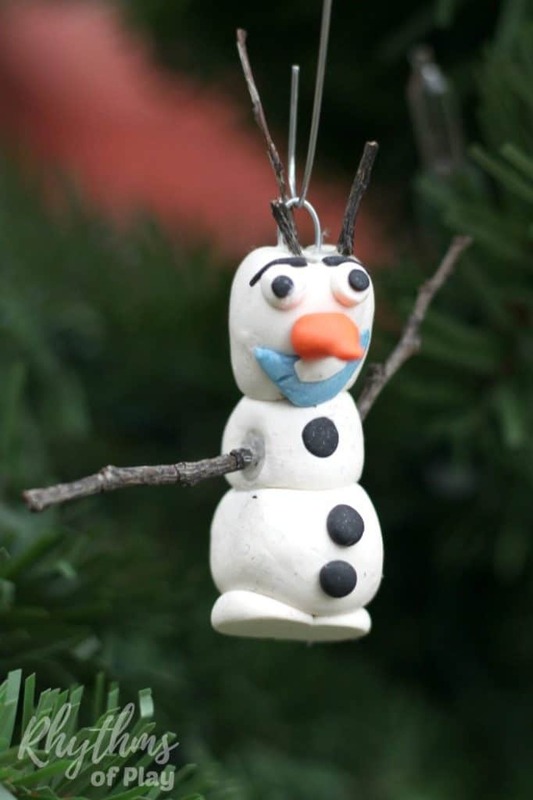 Handmade ornaments like this polymer clay Olaf ornament are perfect for the Christmas tree. They make beautiful holiday decorations and a great kid-made gift idea! Be sure you check out our Family Gift Guide and our collection of Unique Handmade Gifts Kids Can Make. Friends and family always adore gifts from the kids! If you are looking for meaningful family Christmas traditions to try click HERE! Ultimate Family Gift Guide with DIY and Ready-Made Ideas! What a lovely snowman and thank you for the detailed instructions. I’m assembling a list of things to do over Christmas and this will be on the list. So glad you like these ornaments, Robyn. If your kids are anything like mine they will love making these! Be sure to ask them, “Do you want to build a snowman?” The reaction of my daughter was priceless. And… These ornaments and the other snowmen we made will be enjoyed for years to come. They are really sturdy and built to last. We are going to store them away for next year in an egg carton to protect their twig parts. Have fun!